Last week a Toronto man refused to move his bag off a second seat on a crowded rush hour bus. When pressed by the woman requesting the seat, he apparently lashed out, stomping on her foot and pushing her backwards. He was also caught on tape calling her names and giving her the finger. 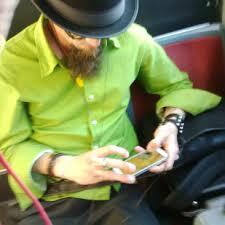 The story went viral and he quickly acquired the nickname #TTCLeprechaun, mainly due to his bright green shirt and bowler hat. Unless this man paid an extra fare for his bag, he had no right to take up 2 seats. Not only is this common courtesy, it is against TTC rules. The TTC claims that it can not find the footage of the alleged assault, meaning this man can not easily be charged. When I heard about Robin Williams’ death my heart sank. Like so many others, I felt as though I had lost a piece of my childhood. It seemed tragic that a man who made so many people happy was so sad. But it also hit me in another way, a way that only someone who has been depressed can understand. I am well acquainted with the dark recesses of depression and the suicidal thoughts that litter one’s mind. Luckily, somehow, I managed to drag myself out of it, but I know that I could easily slide back in given the right circumstances. My twitter feed was full of comments and hopes that Robin Williams had found peace. Somewhat surprisingly, I did not see the tweet that the Academy of Motion Picture Arts and Sciences sent out that said “Genie, you’re free” until I came across this article. When I was battling depression social media was only in it’s infancy. I didn’t have to worry as much about “copycat suicides” or romanticized accounts of high-profile deaths. I didn’t even realize that this was a thing. Upon reflection I can see how these issues could be worrisome and that perhaps, suggesting that death is a positive end to suffering, might be problematic for those who are still suffering. I’m not sure if it’s a good thing or a bad thing that these thoughts didn’t come to mind for me. One thing that did raise my spirits despite the tragic circumstances: the number of positive messages. 10 years ago I mostly kept my depression to myself. Most people I knew thought depression was just being really sad, or that I could “cure” myself if I tried hard enough. The notion that it was a chemical disorder was not widely accepted and people who were depressed were considered weak. This past month I have seen some negative comments, but they are so tremendously outnumbered by comments from people who seem to be getting it. We have a long way to go, but I’m starting to see the light at the end of this tunnel. The most recent fad on social media is the ALS Ice Bucket Challenge. At first glance it seems like a fun way to raise awareness and donate money to charity. And it is. Mostly. As a general rule I tend to not like social media fads; they make me feel like a heard animal and reek of narcissism. This sort of challenge lends itself perfectly to self-licensing. The original “rules” of the challenge say dump a bucket of ice water over your head OR donate to charity. This means a person can make themselves FEEL good and get positive feedback from their peers without actually doing anything of significant value. According to the self-licensing phenomenon someone who feels like they have done good is more likely to engage in unethical behaviour in the future. In this article by William MacAskill he claims that people only give so much to charity and that this type of viral challenge is actually taking money away from other charities. While I really don’t have enough information to determine how much truth there is to that, from my years working in the non-profit field I can tell you that many people do have a donation limit and once it’s spent they will not donate any more.